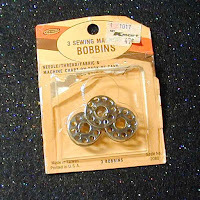 Continuing the cleanup of the sideboard is the package of 3 bobbins that I picked up at yardsale last Saturday. I have several other bobbins out in a storage tub from my mothers' old sewing stuff, so started to add these, when I got to thinking how they might work in a piece of jewelry ... those little holes are just perfecct to hold jump rings. Onward ... Decided it needs to be a fiber necklace ... aferall Fiber is what is put on a Bobbin. Pulled out the 'yarn' container and selected a skein of brown 'Fun Fur'. Then, decided the beads I'd taken off the napkin rings (picked up at the same yard sale Saturday) would work well. Also selected some large Silver Beads to work as end caps and some smaller beads. 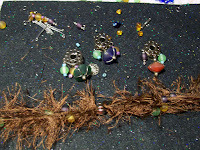 Using silver findings, started putting the piece together. This is my first Fiber Necklace, so I'm figuring it out as I go along.